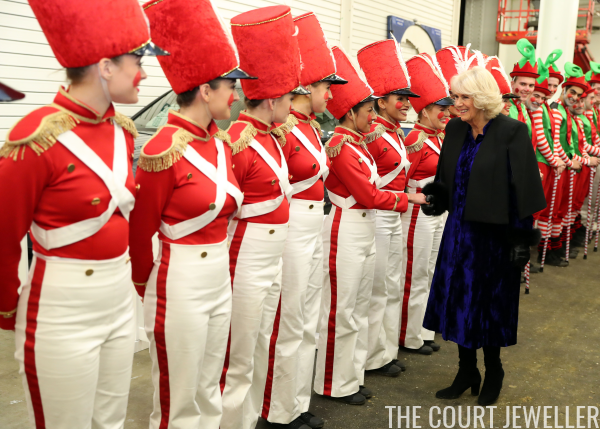 The Duchess of Cornwall celebrated Christmas -- and brought out perhaps her most important British royal brooch -- on Thursday evening at the Olympia Horse Show. 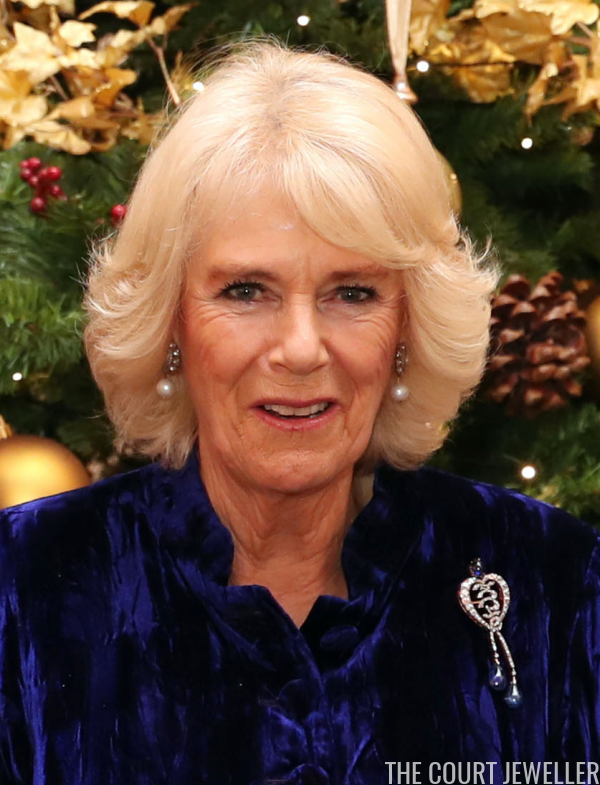 When she removed her jacket, Camilla revealed that she'd worn the Hesse Diamond Jubilee Brooch for the festivities, pairing it with her favorite diamond and pearl earrings. The sapphire and diamond brooch originally belonged to Queen Victoria. It was a Diamond Jubilee gift to Victoria in 1897 from several of the children of her second daughter, Grand Duchess Alice of Hesse and by Rhine. These grandchildren were a very interesting historical bunch: Princess Victoria of Battenberg (Prince Charles's paternal great-grandmother), Grand Duchess Elizabeth Feodorovna of Russia, Grand Duke Ernest Louis of Hesse and by Rhine, and Empress Alexandra Feodorovna of Russia gave the lovely brooch to their British royal grandmother. Here's a closer look at the brooch from the horse show appearance. 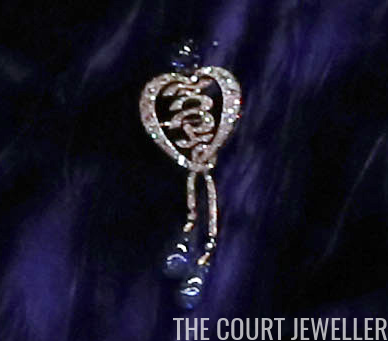 The main diamond portion of the brooch forms a heart shape. Inside the heart is the number 60 (the number of years in a Diamond Jubilee reign) in Cyrillic numerals, which, for comparison purposes, looks something like this: Ѯ. 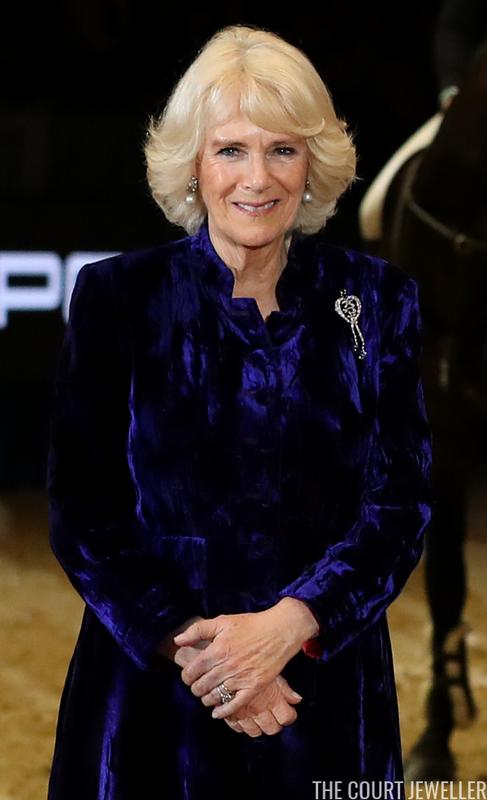 Although they disappear a bit against Camilla's blue velvet coat, there are three cabochon sapphires set in the piece: one at the top and two as pendants. Victoria was not photographed in the brooch, but that's not exactly a surprise: she only lived a few more years, dying in 1901. More surprising, though, is the fact that no royal seems to have been photographed in the brooch at all until Camilla wore it for the first time, during a 2007 trip to the United States. Above, she wears it in Norway during the 2012 Diamond Jubilee tour of Scandinavia. 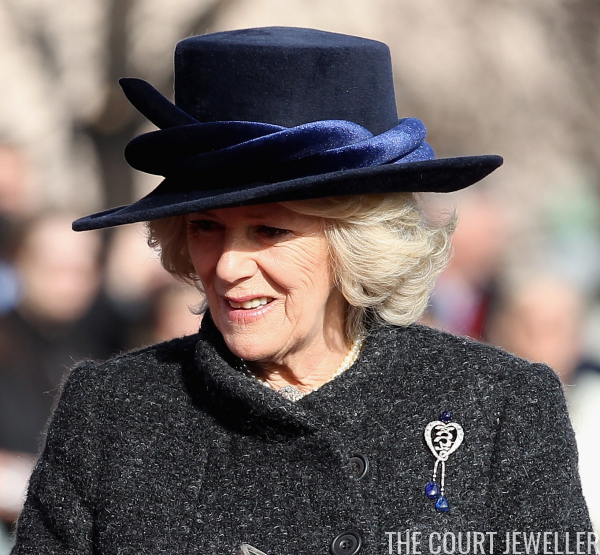 It's not exactly clear how the brooch ended up in Camilla's collection, though one prevailing guess is that it came from the collection of the late Queen Mother.